The last response to Christmas that I would like to explore is that of Joseph - the step-father of Jesus. God speaks to him in a dream and he then takes care of Mary and stands by her in the journey to Bethlehem and the birth of Jesus. He and Mary fulfill all the purification rituals in the temple, offering the sacrifices of the poorest of the poor. God warns Joseph to flee to Egypt because Herod was planning to kill all the infants in Bethlehem and he undertakes this hazarodous journey. Joseph is an unsung hero. In a culture that was strongly patriarchal, Joseph was the last to hear real truth about Mary's pregnancy. He puts his "manly pride" firmly in his back pocket and his resolve to divorce her quietly speaks of righteousness, maturity and his true love for Mary. He plays a back-seat role and does so solidly and reliably. Maybe, on the brink of Christmas Eve, Joseph is the character we must hold close to our hearts. Like Joseph we must know that it is not about us. We should be open and sensitive to the prompting of the Spirit. We should use our God-given common sense to live simply and cautiously - avoiding danger and temptation - trusting that God can use our decisions. Let's remember that being parents, grand-parents, guides, teachers and mentors can be one of the greatest legacies we can ever leave. May your celebration of Christmas be warm and blessed. 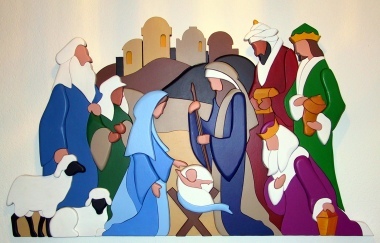 Take Joseph, Elizabeth, the Magi, the Shepherds and Mary as your guides. It is this affirmation and this delight that causes Mary to magnificate! Scholars are divided about the shepherds: Some identify them as being on the criminal and deviant fringe of society - dishonest, unscrupulous, thieving, cruel, irreverent and undesirable. Other scholars suggest that they were the shepherds in charge of the temple passover lambs and that, as such, they were a special group of shepherds with a holy task. I prefer the first option. ...10 When they saw the star, they were overjoyed. 11 On coming to the house, they saw the child with his mother Mary, and they bowed down and worshipped him. Then they opened their treasures and presented him with gifts of gold and of incense and of myrrh. 12 And having been warned in a dream not to go back to Herod, they returned to their country by another route. Secondly we need to be sensitive and obedient to the promptings and responsive to the signs and needs that God is drawing our attention to. We need to be willing to go and willing to be prompted. The Magi followed the star's guidance, but also listened to the dream they had about Herod. But their greatest sensitivity is shown in the gifts they bring: Gold symbolising Jesus' kingship, Myrrh which anticipated Jesus sacrificial death and Frankinsense which pointed to His role as our priest. Later, when John the Baptist has done a happy dance in Elizabeth's womb Mary bursts forth with what we now call "the Magnificat" - a hymn which reflects a significant understanding of who God is, what the Messiah came to do, and her part in all of it. Mary was not perfect* but there is a lot we can learn from her faithfulness and devotion. But what was Mary's secret? I believe it is the attitude of thoughtful wonder. Luke affirms this twice over in Lk.2:19 & 51. Mary observed the birth, the shepherds, the magi and pondered and treasured them. She reflected on the 12 year old Jesus surrounded by flabbergasted teachers of the law and treasured these thoughts. We can know the Christmas story. But have we pondered and treasured it? the introduction emphasizes Naomi's emptiness, and the conclusion portrays her fullness." Joel 2:25 "I will repay you for the years the locusts have eaten..."
Genesis 50:20 (Joseph to his brothers) "You intended to harm me, but God intended it for good to accomplish what is now being done, the saving of many lives." Sometimes God brings about restoration in dramatic and wonderful ways. Not so in the book of Ruth... Here the turnaround takes time and is the result of a number of "God-incidences" where God is working in the little details of life to fill Naomi with blessing and joy in spite of the hardships she has been through. There are no guarantees that life will be easy. Famine can come, death is a reality we always face. We can find ourselves in a foreign place far away from home and we might even have chapters in our lives where we have to say that our lives are "Mara" (bitter). But we have a Saviour who ate the bitter herbs of the Passover with His disciples before going to the cross to endure the worst bitterness of sin-brokenness so that we will never be alone in our hardship. And then He rose from the dead so that brokenness will never have the final say. Healing may take time and may happen slowly, but like Naomi, we will find that God fills us up when life has emptied us out. This brings us to the end of our series on Ruth - I hope it has been meaningful to you. There is a lot at stake in this short book: Ruth becomes the great-granny of David and is included in the genealogy of Christ where she is singled out and honoured both as a foreigner and as a woman. There are some key ingredients to the happy ending this story has. Naomi has it. Deep unflinching faith that endures difficulty with honesty and realism. She is secure enough in her relationship with God that she can "tell it like it is." At the same time, her witness is attractive and sincere enough that Ruth wants to be part of it. Ruth has it. A deep commitment to follow God, even in uncertainty and even if it means being teachable enough to follow a mother-in-law's advice. Her actions, especially in her faithfulness to Naomi, portray her faith to those around her. Boaz has it. In word, deed and reputation. He is respected and people bless him in terms of the faith they see in him. Naomi (which means "Pleasant") is consistent with the meaning of her name. Ruth is commended for her sincerity and faithfulness. Naomi's generously urges her daughters-in-law to go home instead of accompanying her to Israel. She put their needs before her own. Boaz is generous toward Ruth and Naomi in the gifts he gives them, in having lunch with Ruth in the public eye, and in the speed and righteous efficiency with which he sorts out the legalities. Ruth is generous toward her mother-in-law by being willing to start again in a foreign land as a foreigner. But in our text verse we see yet another generosity: Ruth shares her child with Naomi to such and extent that the town's people say: "Naomi has a son." While this was true in terms of the legalities of the Kinsman-Redeemer tradition, it was also functionally true in the way in which Ruth shared her first baby with Naomi who had already had two of her own. Faith, Integrity and Generosity. Naomi,Ruth and Boaz had these qualities in spades. When we see these qualities in David we can say "He had it in his genes."